LayerOn controls which layer an object is rendered to. By default the value is blank which means that it will be sorted with all other objects with no layer. 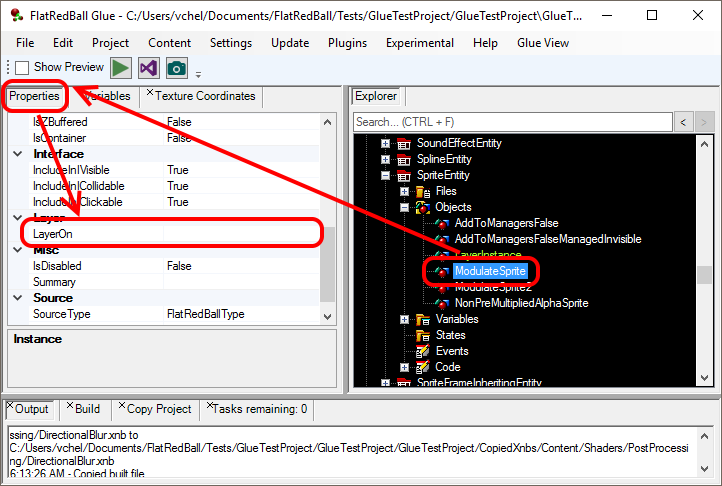 This value can be changed on an object’s Properties tab. For an object to be on a Layer, a Layer must be defined in the same Screen/Entity that a given object is a part of. Once this occurs you can either use the LayerOn property to set the Layer, or you can drag+drop the object onto its desired Layer in the Glue UI. Under Everything (Engine Layer) – A layer automatically created by the FlatRedBall engine for objects which should be drawn under everything, including objects with no layer. Layer Objects – Any Layer Object will appear in this list. If no Layers have been created in the current screen/entity, no layers will be shown here. The screenshot below shows LayerInstance, which is a Layer added to the SpriteEntity (shown in light green). Top Layer (Engine Layer) – A layer automatically created by the FlatRedball engine for objects which should be drawn above everything, including all other layers. At the time of this writing, only non-list objects can be added to layers. 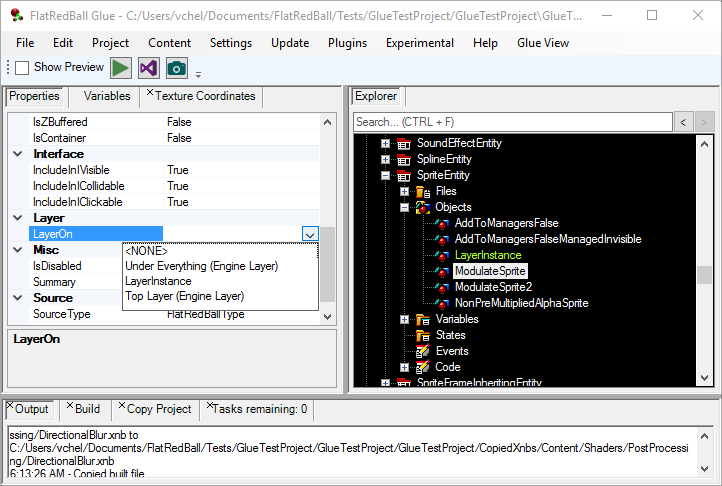 This is because lists do not have built-in support for layers in the FlatRedBall engine, and Glue is simply exposing default FlatRedBall object behavior for layering.